1) Download the Forms Pro from the product page Link. Depending on your O365 subscription plan you will need to navigate to your app catalog directly using the web address: https:// [your_domain_name].sharepoint.com/sites/AppCatalog/. 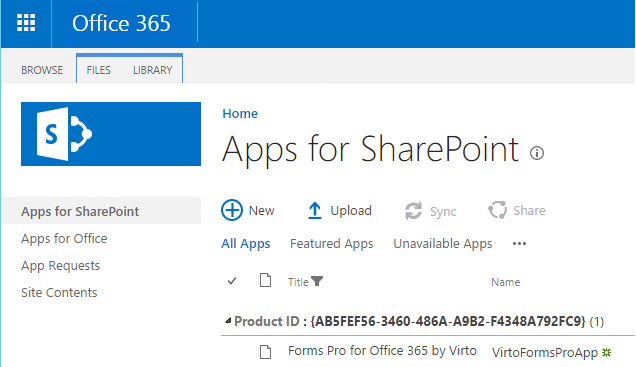 4) Click “Site content”, add a new app and choose the link "From Your Organization", click "Forms Pro for Office 365 by Virto" icon and trust it. 5) After that Virto Forms icon will be added on the Ribbon pane, so you can launch it directly from your Lists or Document Libraries. 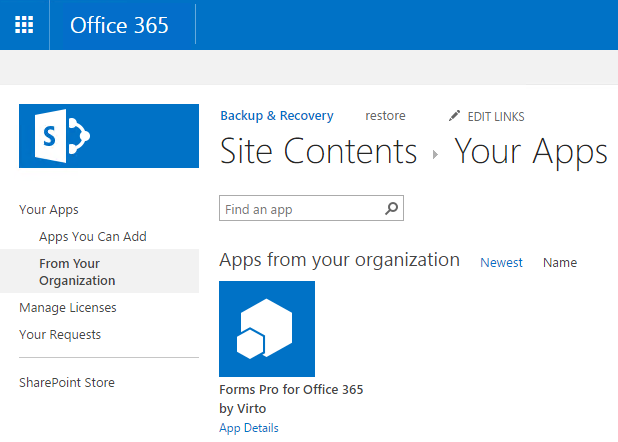 Or you can launch it from Site Contents on Site Collection where you've installed Forms Pro App. 6) Now you are ready to create beautiful custom forms in your SharePoint!